The Heart of Maryland Chorus is a membership organization of female singers, who meet regularly to practice, perform, socialize, and have fun. We currently have over 40 singers of all ages, all walks of life, and all parts of the Rockville and Montgomery County areas. The main purpose of the Heart of Maryland Chorus is to get out and sing for our community. We sing at annual shows, a number of community events, and at annual competitions. We are available to sing at your next function or event. If you're looking for a unique musical experience to liven up your event, please use our Contact form and we will get back to you right away! In the spring of every year, the Heart of Maryland Chorus participates in the Region 19 chorus competition in Ocean City, Maryland. Competitions are a special time for quartets and choruses from our region to come together to sing for each other, and get some constructive feedback from a panel of judges. The winners of the regional competition in both quartet and chorus categories get to travel to International Competition, which is held in the fall in a city selected each year. Click here to learn more about International Competition. Most choruses have a number of members who form their own vocal quartets in addition to singing with the chorus. The Heart of Maryland Chorus currently is home to a number of wonderful quartets, and we are very proud of them! Click here to see our quartet section to learn more about them. 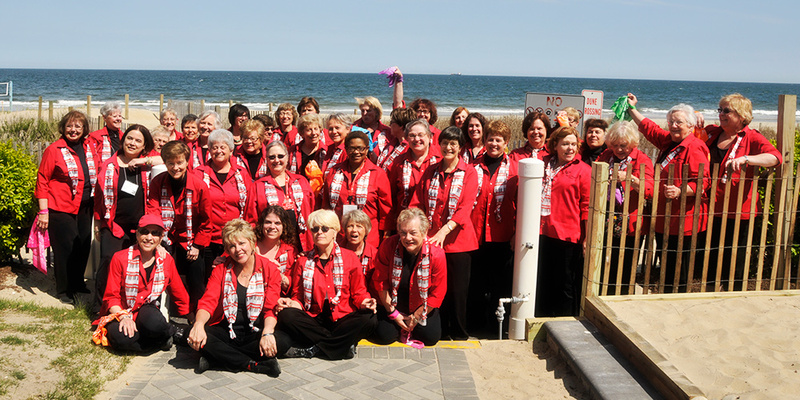 The Heart of Maryland Chorus is a chapter of Sweet Adelines International, a non-profit organization of approximately 28,000 members in choruses and quartets, worldwide. The Headquarters is in Tulsa, Oklahoma.